The compiler had problem converting the two string value into LPCWSTR type. argument of type "char" is incompatible with parameter of type "LPCWSTR"
The first solution was to prefix it with an L to convert it. My firs question is whats happening when I prefix the strings with an F? Is it the same as casting in C#? My second question is whats happening here exactly when I set the character set, and why automatic casting is possible when it is set to Not Set? The character encoding is always a tricky problem in C++ since the language has no built-in Unicode support which means strings are always char* or wchar_t*. The standard defines a few way to declare string literals as shown here. There is no "casting": the compiler will look at your literal and convert it according to the prefix you put in front of the string. 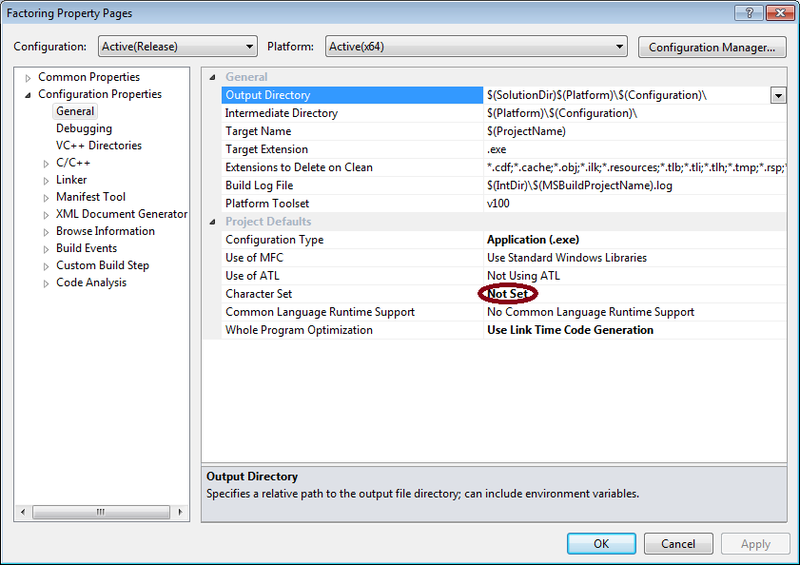 The project options change what kind of string the Windows API functions will expect. If you send them strings that don't match this you will either get a compile-time error (if you use wide chars in one and not the other) or some problem in the character display because the program gets a different encoding. For example if you set the encoding to unicode but you declare your strings without the u8 prefix, non-ASCII characters will display wrong. If you do force the conversion between the wide chars and the small ones with a cast, your string will be corrupted and in some cases the null-terminator might not be read and you will crash your program. So if you see a (char*) or a (wchar_t*) you'd better know very well what you're doing. Not the answer you're looking for? Browse other questions tagged c++ c++11 visual-c++ casting or ask your own question. Can the HWND from CreateWindow/CreateDialog be GetMessage'd from another thread?